School of Rock, the latest work by Andrew Lloyd Webber, a living legend that brought you immortal masterpieces such as The Phantom of the Opera and Cats, will be shown in Beijing. 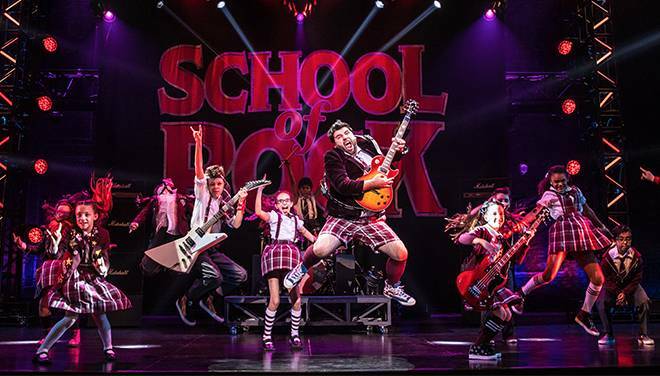 Reimagined as a musical, School of Rock brings new joy and energy to the hit comedy film. Mon Apr 8-Sun Apr 14, various times; RMB380-1180; Tianqiao Performing Arts Center, see event listing. Buy tickets here. Get the chance to learn the secrets of Italian cooking and make your own fresh egg pasta in a three-and-a-halfhour cooking course guided by an expert instructor. After watching a demonstration, you try your hand at your own tagliatelle and dessert, before savoring your creations with a glass of wine at the end of the day. Wed Apr 10, 10.30am; RMB350; The Hutong, see event listing. Beijing is cherished for its historic hutongs. What does that tell you? That you should go see them, of course! To help you uncover the secrets and the beauty of the beloved labyrinthine alleyways, Bespoke Beijing launched a new tour dedicated to them. With only two April dates – so book fast – and the guidance of a local Beijinger, the tour will take you up the Drum Tower and down the narrow roads to discover hidden treasures. Wed Apr 10 & Sun Apr 21, 9am-12.30pm; RMB500 (all entrance tickets included); meeting point at the Drum Tower ticket office, see event listing. Buy tickets here. Un Ballo In Maschera retells the story of the assassination of King Gustav III of Sweden in the 18th century, though for reasons of censorship at the time, the king becomes a duke in the libretto. It follows the drama and tragedy surrounding the ambivalence of Amelia in pursuing extramarital romantic love while trying to safeguard her husband’s dignity. The Argentinian scenographer Hugo De Ana and Italian choreography Marco Pelle bring it to the stage at the NCPA, creating a production that displays the aristocratic drama of one of Verdi’s great operas in all its opulence. Wed Apr 10-Sun Apr 14, 7pm; RMB100-680; National Centre for the Performing Arts, see event listing. Buy tickets here. Indie rock act Wild Nothing embarks on a four-city China tour this month, with a stop in Beijing on Friday, April 13 at Omni Space. Wild Nothing's first debut record Gemini, featuring the animated hit 'Chinatown,' was released in 2010 and was very well received by contemporary music critics. Helmed by American singer-songwriter Jack Tatum, the dream-pop project just released a fourth full-length album Indigo last summer. The new record dives into the themes of love, technology and human connection and is an undeniable nod to the 80s with its lush synths and sublime melodies. Read our full interview with Tatum here and enter our giveaway to score a pair of tickets to the show. Fri Apr 12, 8.30pm; RMB280 (presale), RMB360 (door); Omni Space, see event listing. Buy tickets here. Celebrated worldwide, Record Store Day is a special event to appreciate and promote vinyl culture. fRUITYSHOP will host some of the city's leading record lovers and DJs such as Boss Cuts and Watermelon, as well as a fresh stock of exciting new releases. Get ready for some major crate-digging. Sat Apr 13; 3pm; fRUITYSHOP, see event listing. It’s the era of the ‘Slash Generation’: energetic individuals with many passions, many jobs and… many incomes. Can you become one of them? Embrace the spirit of the gig economy and sign up for life coach Carnisa Berry’s workshop at EAST Beijing, where you’ll learn to understand your purpose and talents and how to turn your passion into profit. Sat Apr 13, 9am-6pm; RMB3500, RMB800 deposit; EAST Beijing, see event listing. VICE China's Noisey and BieDe Girl host all-girl Japanese funk band BimBamBoom on a five-city tour across China. Formed by Japan's supreme drumming machine Miyoko Yamaguchi and music producer S-Ken, the eccentric quintet is recognized for their mainly instrumental hits infused with lots of funk and sprinkled with cheery chants, and has even graced the Fuji Rock festival stage. From their deliciously groovy cover of 'Lowrider' to the high-energy bop 'O.E.C. Tiger Roll,' BimBamBoom mixes feel-good soul with edgy rock 'n' roll. Their danceable jams will have you moving and grooving all over the dance floor so get ready for a wicked good show at Omni Space. Sun Apr 14, 8.30pm; RMB120 (advance), RMB150 (door); Omni Space, see event listing. Apr 18: Last Chance to Sign Up for the Great Wall Marathon! Tick this one off your bucket list by coursing along one of the seven modern wonders of the world. There are options for full- and half-marathons, as well as a 8.5km stretch for a more moderate experience. The race takes place on and around Huangyaguan stretch of the Wall. Registration closes April 18. Sat May 18, 5am-5pm; Huangyaguan Great Wall, see event listing. For more info and to register, visit great-wall-marathon.com. As you may know, a child’s education starts at home and for it to work, setting rules and establishing communication skills are critical. Children’s education, in all its aspects, is at the core of House of Knowledge’s mission. This is why the state-of-the-art international school, boasting numerous campuses across Beijing, is launching their latest workshop titled ‘Setting Rules for Children – Why and How?’ During the two-hour workshop, taking place at HoK’s Xinglong campus, HoK co-founder Farshad Danicek will share tips on how to set boundaries and understand child behavior more clearly. Parents out there: don’t miss this opportunity to become better at your… uh, unofficial, full-time job. Thu Apr 18, 9.30-11.30am; free entry; House of Knowledge, see event listing. The British TNT Theatre Company unites the myriad themes and symbols of Shakespeare’s most anarchic play, linking drama and comedy. The popular touring company is known for their engaging and charismatic productions, and has scooped up numerous accolades over the years. Thu Apr 18-Sat Apr 20, 7.30pm; RMB180-380; Nine Theater, see event listing. Buy tickets here. The Cloud Gate Dance Theatre performs their repertoire of modern dance infused with ancient aesthetics at the NCPA. The 24 dancers that make up the company receive training in meditation, Qigong, calligraphy and internal martial arts, as well as modern dance and ballet, to create a performance that embraces both the traditional and contemporary. They have performed across the world, from the London Barbican to the Moscow Chekhov International Theatre Festival. Thu Apr 18-Sun Apr 21, 7.30pm; RMB180-680; National Center for the Performing Arts, see event listing. Buy tickets here. At the NCPA, the Beijing People’s Art Theatre presents The Visit as a Chinese-language adaptation of the 1956 tragicomic play by Swiss dramatist Friedrich Durrenmatt. It tells the story of a hugely wealthy woman who returns to her hometown with a bargain: she will donate some of her fortune to revitalize the town in exchange for the townspeople killing the man who once made her pregnant and jilted her. The company, which was established in 1952, has been instrumental in promoting Chinese-language theatre abroad as well as at home, beginning with its performance of The Teahouse in 1980. Thu Apr 18-Sun Apr 21, 7.30pm; RMB300-680; National Centre for the Performing Arts, see event listing. Buy tickets here. Two of Beijing's favorite cover bands have come together to create a casette featuring a collection of original tracks. Stop by the release party to pick up a copy for yourself! Fri Apr 19, 9pm; RMB50 (advance), RMB60 (door); DDC, see event listing. Fri Apr 19; RMB100 (includes one drink and gourmet canapes); YIN on 12 @ New World Beijing Hotel, see event listing. Sat Apr 20, 9pm; Modernista, see event listing. Easter Sunday is coming up this month and that means there will be brunches happening all around the city. Stay tuned for our full guide on the best places to celebrate. American rock band Black Rebel Motorcycle Club will grace Beijing audiences right before they hit the Strawberry Music Festival stage in Shanghai and Chengdu. Catch the dark and moody rock and roll trio at Tango at the end of the month. Wed Apr 24, 8.30pm; RMB320 (presale), RMB400 (door); Tango, see event listing. Buy tickets here. British singer-songwriter Isaac Gracie lands in the capital this month. He started singing in the Ealing Abbey Choir at an early age and writing his own music by 14, eventually going on to release his debut full-length album last year. Catch him at Tango for a laidback night of folk rock. Thu Apr 25, 8pm; RMB280 (presale), RMB380 (door); Tango, see event listing. Buy tickets here. This month, the L.A.-based yet Brit pop-inspired band Warbly Jets will stop in Beijing along their China tour to entertain the audience with pieces from their latest release, Propaganda. Catch them at their one and only Beijing gig at Yue Space. Sat Apr 27, 9pm-late; RMB160 (advance), RMB220 (door); Yue Space, see event listing. Buy tickets here. Mohawks, neon colored hair, studded belts and leather jackets have become the stereotypical emblem of punk rock – an aggressive image that has frightened parents for decades on end. Descendents, however, are pretty much the antithesis of the Manic Panic-clad kids coloring the scene. Formed in 1977, the pop punk band is considered a pioneer of the genre known for their signature angsty sound and a well-respected discography. Breaking stuff and skipping school were never part of their brand, as is evident by the title of their first release, Milo Goes to College. Read up on the band in our interview with frontman Milo Aukerman before their raucous show at MAO Livehouse this month. Sun Apr 28, 9pm; RMB280 (presale), RMB330 (door);MAO Livehouse Wukesong, see event listing. Buy tickets here. For those who are fascinated by Japanese anime, don’t miss this special night at Tango where your favorite anime theme songs will be played live. The track list features compositions from renowned artists like Yoko Kanno and Maaya Sakamoto. Catch the spectacular performance at the end of the month. Tue Apr 30, 7.30pm; RMB280-580;Tango, see event listing. Buy tickets here. China World Summit Wing presents a tasty collection of tea-inspired delicacies available through April, just in time to celebrate the spring tea harvest season. The specialties are made with tea sourced from a Longjing tea plantation in the West Lake region of Hangzhou. The hotel has also prepared a selection of exclusive spring tea gift items for guests to bring home with them. Feast on a wide selection of culinary specialities from main entrees to desserts, all inspired by the flavors of Chinese tea. Through Tue Apr 30; China World Summit Wing, see event listing. Beijing’s sweltering summer heat is no match for the right combination of cold frothy beer and great food. Jing-Jing is officially back for the season! Relax with some Jing-A brews and bar bites by chef Li Dong of Jing Yaa Tang in a sunken craft beer garden. Daily (closed Mondays), 5pm-midnight; The Opposite House, see event listing. Migas just premiered an unlimited tapas extravaganza for just RMB298. Go wild with over 30 different dishes, featuring traditional Spanish bites (don't miss the Catalan-style cannelloni stuffed with duck and pork and smothered in cheese) and brunch classics. Saturdays and Sundays, 11.30am-2.30pm; RMB298/person, RMB168 for free-flow drinks; Migas Mercado, see event listing. TRIBE is dishing out some nutritious new spring specials, in colorful style, as usual. Get your veggie fix with dishes like the stir-fried breakfast grain bowl with black olives, bell peppers, egg and mushrooms, and their lentil salad, made with brussel sprouts, apple, arugula, avocado, goat cheese and more. Finish on a sweet note with their cashew cheesecake toped with cranberry sauce. Daily; available at all TRIBE locations, see event listing. Wednesdays just got a whole lot happier: Get to Des Link, the bar and restaurant by Destination, and enjoy a buy-one-get-one deal on Slow Boat’s Monkey Fist IPA all day long. Wednesdays; Destination, see event listing. Have an event to list? Head here to list your upcoming event. 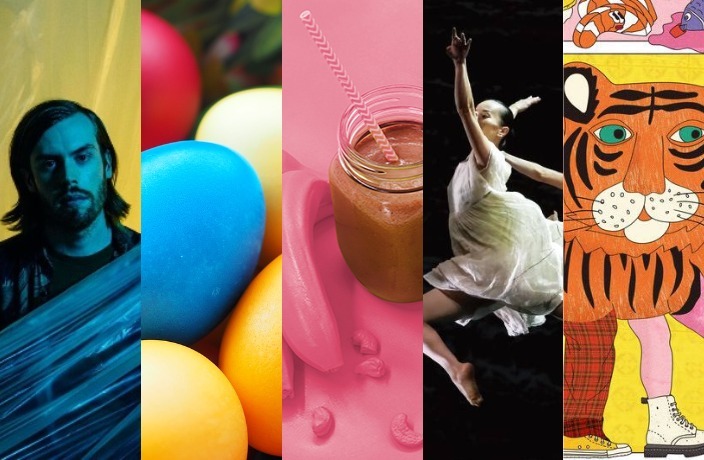 We’ll choose the best new additions to feature on next week’s edition of ‘What's On in Beijing.' Not sure where to start? Here's a full guide on how to list your upcoming events on our website. We chat with the organizers and supreme DJs behind the series of events taking place this weekend. The best tracks from artists playing in Beijing in April - all in one handy Spotify playlist. From stand-up comedians to Mardi Gras-themed drag brunches, there's plenty going on in Beijing this month. Beijing loves an excuse to drink beer – and man, is St. Patrick's Day an excuse to drink beer. From Chinese New Year's Eve dinners to indie rock gigs, there's plenty going on in Beijing this month. A look at what's happening at Beijing's art galleries this month. From frozen river hikes to classic rock gigs, there's plenty going on in Beijing this month.